From elementary school years to adulthood, sports are a favorite hobby for many. For some, it’s the building blocks to a career in athletics. No matter how frequently you play, durable practice courts are crucial for every sport. Children who are in athletic extracurricular activities get to practice right at school. Physical Education (P.E.) classes are great for conditioning and practice because students get to play on professional-grade courts specifically designed for high-impact activities. Most often, these are at schools or indoor gym facilities. In New York State, outdoor temperatures are harsh during the majority of the school year, making practice more difficult. That is when coaches turn to indoor sports facilities during the cooler months. When the temperatures are favorable, it is more advantageous to practice in outdoor facilities and sports fields. Everyone enjoys a good game of hoops at least once in their life. You can most often find at least one basketball hoop at schools, YMCAs, recreation centers, and gyms, but most of these types of practice facilities are only open during select hours. You may also find yourself competing for court time or losing out altogether if someone has “claimed” the court first. For more dedicated skill building, we recommend that athletes continue their practice with dribbling and shooting free throws at home. 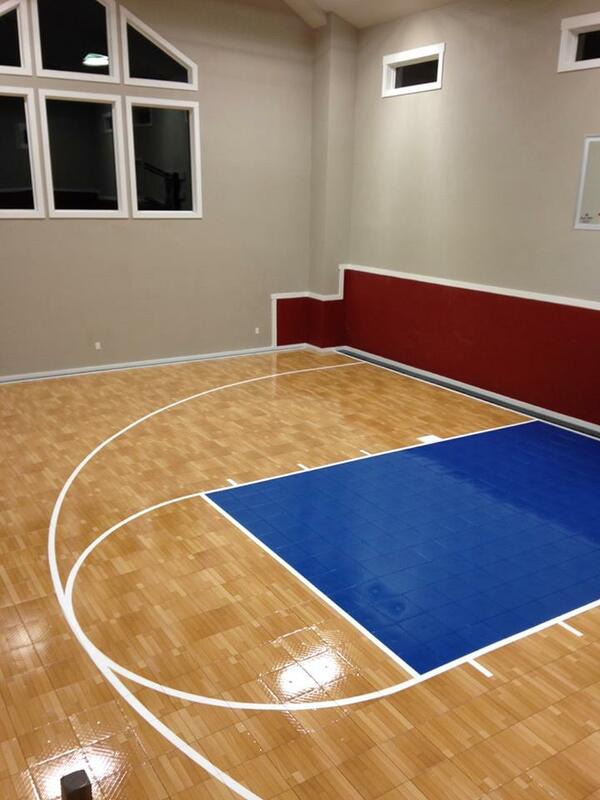 Our experienced custom basketball court builders in New York can design a space that fits right at home. Consider basements, garages, rooftops, and driveways, which all frequently have enough space for effective home practice. 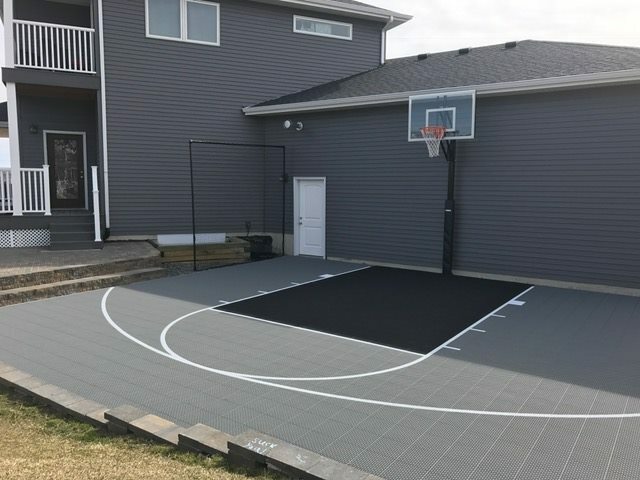 No matter where you build it, a custom basketball court is a great way to build your skills. The game of racquetball is gaining traction, and more homeowners are requesting racquetball court construction. Typically played in single rooms or outdoor stalls, it’s quite easy to build a sufficient racquetball right at home. All you need is an experienced court builder and the right type of gym flooring. Hardwoods tend to do best for indoor applications because they are durable and can be easily refinished. Residential gym flooring is quite versatile. It’s the preferred sports surface for many different types of sports. If your son or daughter wants to practice cheer or volleyball at home, definitely opt for residential gym flooring. You need a surface that won’t buckle from heavy use. It’s recommended to request sports padding underneath for adequate support for dives, jumps, and round off handsprings. Just like indoor cheer gym flooring, a rubber basketball court can be quite beneficial for at-home gymnastics training. If you opt for the traditional basketball court construction, it will serve as the perfect surface for gymnastics moves. All you need is rubber mats to perfect your vault running, tumbling, and round-off back handsprings. Residents throughout Long Island love to play a good game of tennis. The great thing about tennis court construction is that it is versatile enough to be quickly built both indoors and outdoors. Flex Court Athletics has many options for tennis court construction throughout New York, Long Island, and New Jersey. Today, aging adults may desire a surface with more orthopedic support. Talk with your Flex Court representative about using sports tile as an alternative for durable and versatile tennis court surfaces. Paddle tennis court construction is an ideal alternative to modern-day tennis because it’s a smaller court. This makes it a perfect addition to backyards and basement spaces. Even if you prefer tennis, a paddle tennis court can provide ample practice space right at home. Both ice and roller hockey are quite competitive in New York. A backyard roller hockey rink can double as both. Simply keep the rink debris free during the warmer months for roller or inline hockey, and use a liner before filling and freezing water for winter ice hockey. This type of practice space is a residential favorite throughout New York State and Long Island. There are other sports that also require diligent practice such as baseball, soccer, and football to name a few. However, residential spaces can be limited, and it’s not as easy to have sports fields built in suburban neighborhoods. A durable, high-quality basketball court or roller hockey court can be an alternative training tool for practice right at home. If you’re ready to explore our residential practice courts, contact Flex Court Athletics of New York. We service Long Island, New Jersey and most of New York State. We have several options for residential gym flooring that are sure to provide the best practice space possible. Request your free consultation with us today! This entry was posted in Basketball Courts, Gym Flooring and tagged backyard roller hockey rink, basketball court, custom basketball court, gym flooring, paddle tennis, paddle tennis court construction, practice court, racquetball court construction, residential gym flooring, roller hockey rink, rubber basketball court, tennis court, tennis court construction. Bookmark the permalink.